Teeth take a lot of tender, loving care. And even when we do our best to practice daily dental hygiene, bacteria can still sneak in and cause tooth decay – the common cold of oral health. At Marcos Ortega DDS, we have been filling cavities for years and would be happy to take care of any cavities or other dental troubles you are experiencing. Few individuals go their entire life without getting a cavity in San Diego. Unfortunately for some children, a cavity in San Diego is the first health problem they suffer in childhood. Cavities are caused when bacteria, acid, food debris, and saliva combine to form plaque. Plaque then clings to your teeth and the acid in the plaque starts to dissolve the enamel. The result is a hole in your tooth which can also be accompanied by pain. Because of how quick and effective dental fillings are, they are one of the best options to repair a cavity in San Diego. At Marcos Ortega DDS, Dr. Ortega uses top-of-the-line instruments to examine the size and severity of the cavity and then ascertain exactly what type of filling is needed. We offer white fillings that are as durable as conventional metal fillings and match your teeth precisely. Once a decision is made on what filling you’ll need, Dr. Ortega will perform the needed preparations for the procedure. 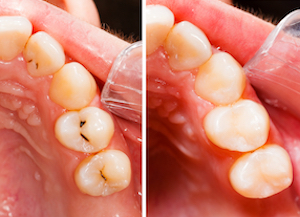 When a filling is performed the right way, it can last for decades! That’s why we make sure the treatment is done with exactness. A filling isn’t a treatment you get and forget about. A tooth that has received a filling still needs to be properly cared for because cavities can develop in the surrounding tooth structure if bacteria are allowed to flourish. Checkups are a critical part of caring for your teeth and there’s no better place to receive checkups than at Marcos Ortega DDS. We have a comfortable, state-of-the-art office and a friendly, professional staff. That’s why so many individuals in San Diego have trusted us with their teeth since 1986. If you’re interested in services such as dental implants, Invisalign clear braces, and sedation dentistry.